Should only eat mussels when there is an 'R' in the month? The idea of eating mussels from September to April is because this is when they have a higher meat content and are at their best. This is not because the mussels are poisonous. Traditionally mussels spawn as the waters warm in late spring, this reduces their meat content and weakens them which in turn impacts on the mussels shelf life. In recent years the spawning season has become harder to predict due to fluctuations in water temperature brought on by climate change. 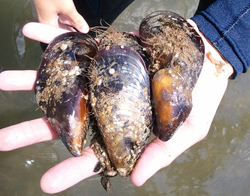 Some mussels have spawned early Autumn due to a cold damp Summer and a warmer September! We make a point of letting our customers know if we believe the mussels have spawned so that you can make an informed decision. We also turn to using tidal mussel as this is hardier and slightly more rugged looking, but tends to to be less affected by the spawning season. The main cause of toxic mussels is due to toxic algae blooms which tends to happen late summer. Because we work in classified waters that are regularly tested, we know as soon as there is a problem and can source our mussels from unaffected areas. Do I need to soak my mussels in water and oatmeal? No. This used to be done to help purge the mussel of any grit. All commercially sold mussels legally have to be purged and purified in UV filtered water for 42 hours. During this time most of the grit and sediment is released from the mussel. Do I need to soak the mussels and throw away the ones that float? Salt water mussels should never be soaked in fresh water as this will kill them, and as explained in the above answer there is no longer any need to soak mussels. This was done in the past to identify dead mussels. People thought that a floating mussel was a dead mussel, which is also is not true. A live mussel can often trap an air bubble when it snaps shut, and this is why some mussels float. To identify dead mussels see our page on preparing mussels safely. Fresh mussel meat has about the same amount of protein as beef steak, but much less fat, 25% fewer calories and more nutrients. Selenium - antioxidant, which helps the immune system and thyroid. Great for hair, skin and nails. Protects cells and tissues from damage, Can improve fertility. Vitamin B12 - 100% of RDA, helps maintain nerve fibres and red blood cells. Zinc - wards off cold and flu viruses. Folate (Folic Acid) - helps produce and maintain new cells. Omega 3s - help prevent heart disease, high cholesterol, blood clots, and aids circulation. Vitamin C - helps protect cells and keeps them healthy. Iron - great for hair, skin and nails. Helps make red-blood cells. Helps the immune system. D-aspartic acid and NMDA (N-Methyl-D-aspartate) - aphrodisiac, which can trigger a release in hormones.